It was time to wash dishes, but a light under a little padlock symbol was illuminated on the front panel of the dishwasher, and no button on the panel worked. I couldn't start the dishwasher. The chilling thoughts of an overpriced repairman or, worse, a new dishwasher rushed through my head. I looked closely at the front panel and found the brand name. Even that was a challenge because years of use have caused some of the writing on front to fade. But there it was: Whirlpool. I was about to find out the difference that a good brand name makes. I Googled for an owner's manual, and I was directed to the Whirlpool site, which maintains a well-kept collection of owner's manuals. Unfortunately a lot of companies are careless about maintaining their documentation, but Whirlpool maintains theirs in the most professional manner. The site required only the Model Number, and I was equally ignorant about that, but there was a link just below the space for the model number that said, "Where is my model number?" 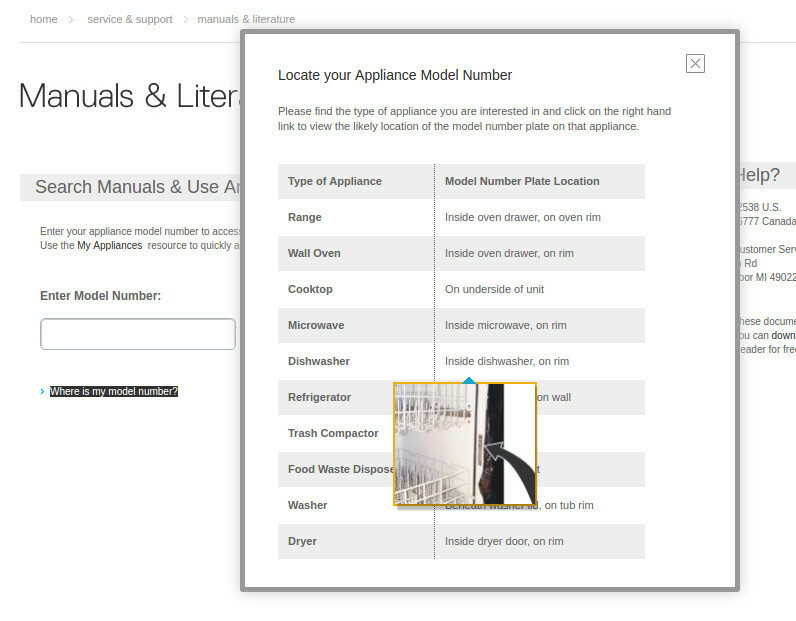 I clicked on that, and up popped a table that said for dishwashers, the Model Number is along the inside rim. There was even a picture with an arrow, so now I knew where to look. to exactly what I needed to know. The arrow points at the model number. So, armed with visual instructions on how to find the model number, I opened up the dishwasher and took a picture of the label on the inside rim with the model number. I use this trick a lot: when information is in an awkward place, I stick the camera there and take the picture. This works at the grocery store when cans are on the bottom shelf; it works when I'm looking for an audio plug on the back of my computer; and it kept me off my knees while getting the model number of my dishwasher. Now armed with the model number—you can see it there in easy to read black & white, DU948PWPQ2—the Whirlpool site immediately handed me the manual in a PDF file (which I have added to my Cloud-based collection of manuals for everything). The little lock above the green light intuitively suggested that "Locked" was the key phrase to search for in the manual, and intuition was right yet again. 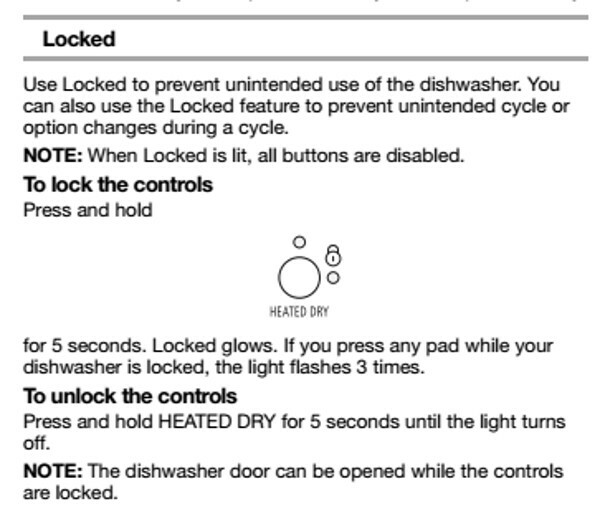 Why one would want to lock a dishwasher was a mystery to me, but I gave a nod to Whirlpool for empowering their customers with the option. Maybe they were thinking of those little kids who wreck Nicholas Cage's mobile home in Raising Arizona. "Well, Glen and Dot are bringing their kids over again. Better lock up the dishwasher, hon'." 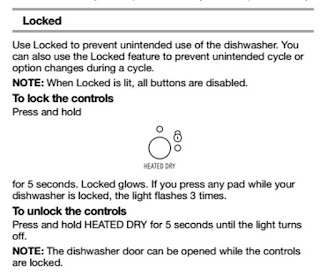 The instructions said to press and hold the HEATED DRY button for five seconds to unlock the dishwasher. 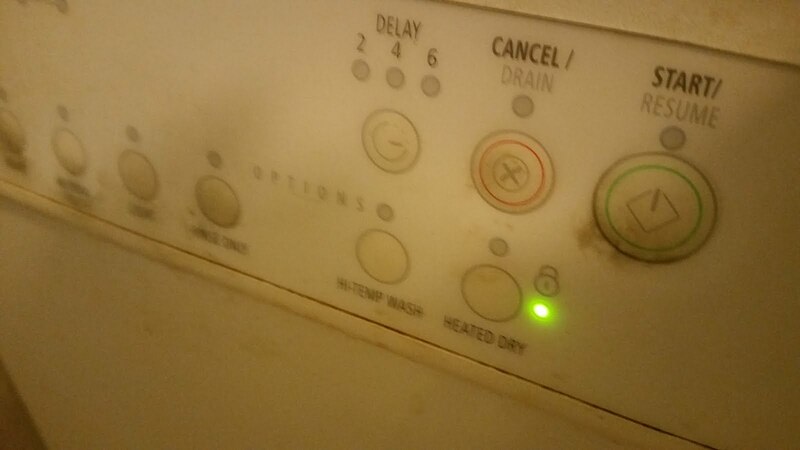 I held my breath, pushed the button, counted to five, and sure enough the lock light went off. The problem was solved, and I started the dishwasher, wandered back to my office and did some more work.